I'm no longer having bad dreams about these things, I know they are a lost cause. I want to know why this has happened. Of everyone else I have asked who has veggies all are fine other than one guy's cucumbers that look the same as mine. The tomatoes are still producing new foliage and may carry on for a good time producing a lot of fruit and the pole beans are still producing but the cucumbers are in dire straits; even the new leaves get yellow spots almost immediately. I generally use a sprinkler for all these, but one of the cucumbers on my deck in a pot is actually under a cover and I only water its roots and it is also spotted up. Is this my destiny, am I unable to grow cucumbers properly? I can deal with visible pests but disease seems a lot harder. I used some box of tomato and vegetable fertilizer 4 weeks ago (I had some black edges on some tomatoes' leaves and I THINK it helped that). I put another dose down a few days ago. On the beans I cut off the dying leaves. We had more heat than they liked but once it cooled down they started producing again. Someone else will have to comment on the rest. I will say that any gardener who is learning will have challenges! I lost almost everything last year. I even lost my tomatoes to late blight. Within a week they were all gone! You have to just try to catch the diseases early and learn how to treat them. The moral of the story is don't give up! kgall wrote: On the beans I cut off the dying leaves. We had more heat than they liked but once it cooled down they started producing again. Oh I forgot to mention my pepper plants, despite looking nice, have stopped flowering. I picked one clean a week back and no flowers since, but enough of these plants are living that I will definitely get back to this next year. My cucumbers go the same thing, but I'm not sure just what it is. It doesn't look like powdery mildew . I wouldn't worry too much about the beans, mine got the same thing on their lower leaves, but still produced. The spots on your tomato plant are a sign of septoria, a bacterial disease. To slow the spread, cull the infected leaves and remove them far from the garden. Also, water in the morning rather than at night. garden5 wrote: My cucumbers go the same thing, but I'm not sure just what it is. It doesn't look like powdery mildew . Thanks, you're right, definitely septoria. My peppers stop flowering when the are too wet. Not a problem for me this year! Please add your location to your profile. If these plants are in northern California (for example), they're unlikely to be dying of the same cause(s) that are killing many plants in the mid-section of the continent (e.g., Illinois). cynthia_h wrote: Please add your location to your profile. If these plants are in northern California (for example), they're unlikely to be dying of the same cause(s) that are killing many plants in the mid-section of the continent (e.g., Illinois). 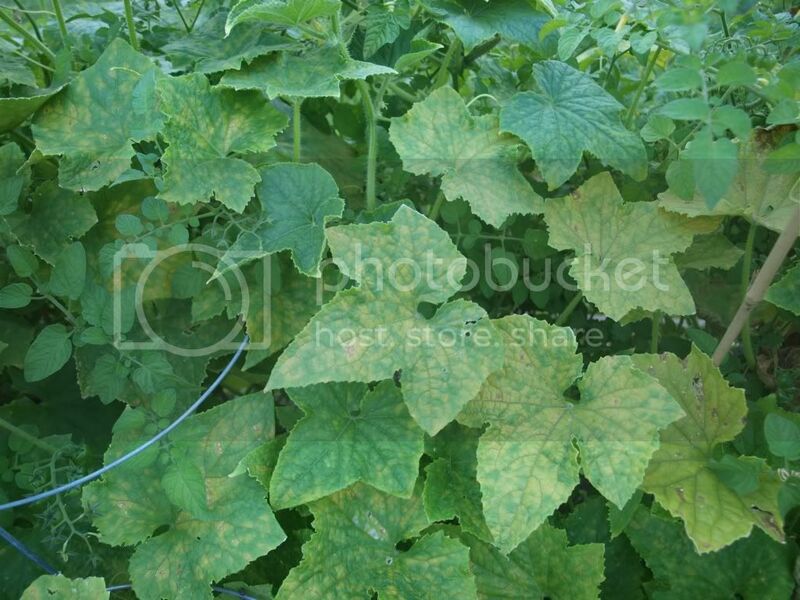 My Mom's cucumber plant has yellow spots too. Does anybody know what this stuff is? Your cucumbers look pretty typical for my cucumbers in Texas this time of year. They usually continue cranking out new cucumbers while the plants look horrible. 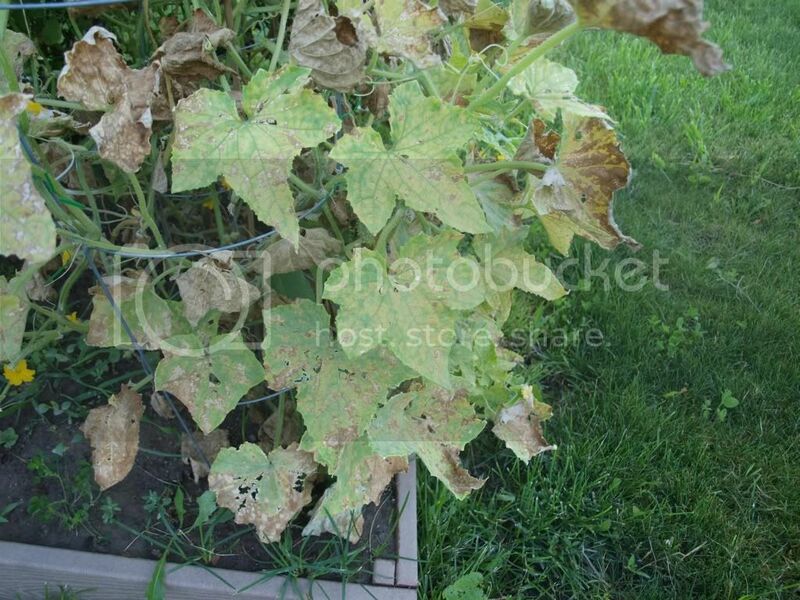 I've always thought the cucumber (cucurbit including squash, melons and others) leaves are simply susceptible to a wide variety of fungus and viral diseases. Many commercial products exist which are supposed to help, but since they are chemicals; I don't use them. You can also select varieties to plant which may have some resistance to the problem. Many people use home remedies which may or may not help. I personally use the diluted milk treatment with success. Don't give up on cucumbers just because they get a little ugly looking. I typically remove the leaves as they yellow. I don't think it helps the plant, but it makes them look nicer. Agree with a lot of the above... it's been a pretty tough season in much of the country. Some places hot and wet, some hot and dry, but most everyone has had excessive heat to deal with. 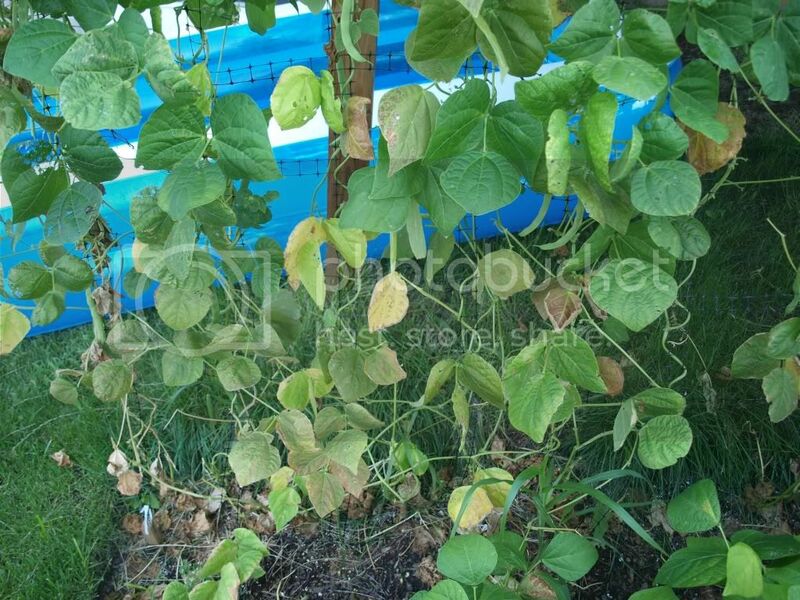 Beans seem to be one of the crops that are vulnerable to this. I would try the milk solution on the cucumbers (AFTER removing the damaged leaves). Type milk solution into the Search the Forum Keyword box to find specific directions for it. The bottom leaves on the tomato usually die off anyway. Just keep removing and disposing of everything that looks bad. 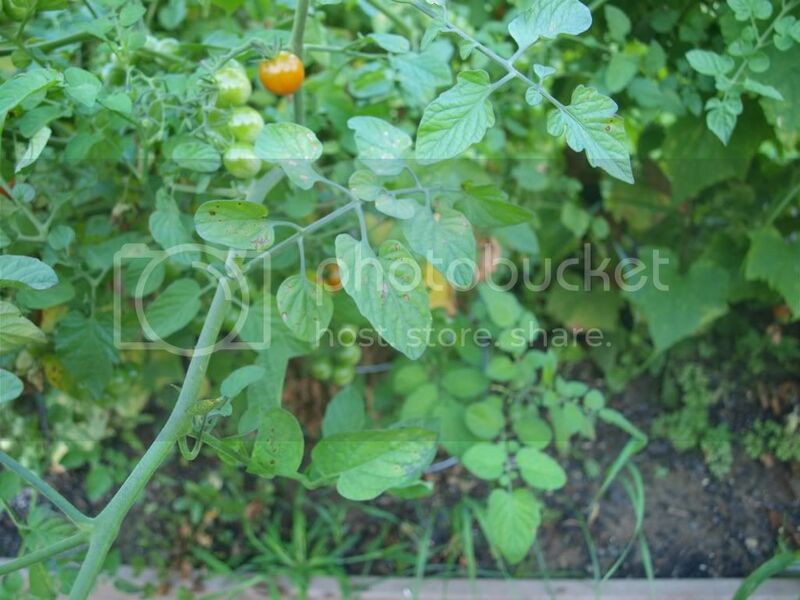 My tomato plants now have a single bare stem for at least the first two feet, then a ton of healthy greenery on top. Looks a little weird, but they are still producing. If you are in hot and humid, be very careful about watering. Water in the AM and water the soil, not the plants. Water deeply and no oftener than you have to. The humidity contributes to all the fungal problems. Hang in there... as was suggested, think about a fall garden; it may go a lot better. Where I am anyway, suddenly when we get to Sept all the excess humidity goes out of the air..
My wife picked a truckload of green beans yesterday. I think overall the beans are doing ok. The japanese beetles were a true hassle but they left as abruptly as they came at the end of July. Skoorbmax wrote: Is a fall garden really feasible in NY state? I planted peas in Wyoming in the middle of July. Our first frost date here is September 22, but peas can take some cold. I also planted peas in Wyoming on August 2 when one of the beds planted in the middle of July did not come up because my dog decided the nice fluffy soil was his sandbox. I don't have high hopes for the second planting, but peas make a great cover crop, a cleanser, so I can always turn them into the soil if it looks like they won't produce. Why is that, though? Why is it that these plants may have a lifespan even less than the frost dates...? i did put these in in May (started seedlings end of April indoors) but the first actual Cucumber was around July 14-15. What do you use to hold bird net or row covers? Leek starts took hold but never grew...why? Garlic: DO IT NOW or forever hold your peace!!! !